A giant card in marble motif is one of our wooden products which made from Teak wood and carved perfectly by our craftsman. To get a beautiful and unique looks, the giant card has polished in marble motif with glossy touch. Perfect for outdoor house decoration. So that, there are many people use it for decorate their patio or porch area. Just put it beside your plants pot and surprised your guest with this unique house decoration. You just need to find a beautiful color of giant card which suit with your house furniture. Find this kind of giant card in blue marble, mix marble, and others interesting colors. 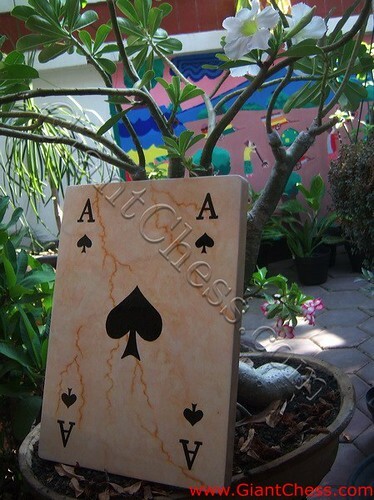 A giant marble card has considerable influence in the appearance of your home. You can put it outdoor and indoor. It is durable wooden product for outdoor and indoor use, by its strongest main material.